Order your Evans G2 Standard Coated Tom Head Package from AMS and enjoy Fast & Free Shipping. Get the Best Deal with our Lowest Price Guarantee & Great Customer Service! 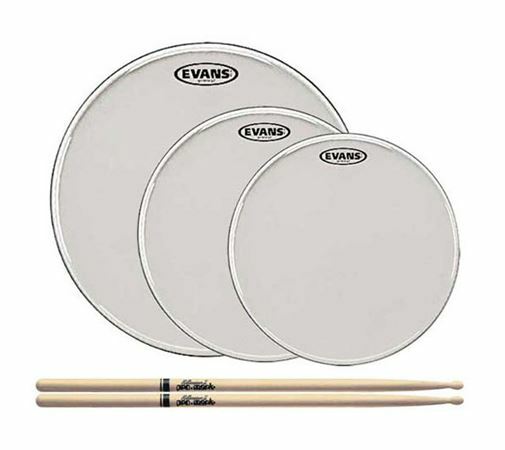 The Evans G2 Standard Coated Tom Drum Head and Drum Stick Package includes three drum heads in one convenient set. The 7mil two-ply 12, 13, and 16 inch G2 coated drum heads produce the perfect blend of depth, sustain, and attack and features extraordinary consistency and durability. Its versatility makes it a perfect choice for the working drummer who switches between styles. It makes rack toms sing and floor toms growl. The coated version delivers additional warmth, focus, and depth. This G2 Standard pack also includes a pair of the popular Pro Mark 5A American Hickory Drum Sticks with wood tip.